You’ve added rooftop solar to your home and are on the path to becoming a smart energy producer and consumer. Way to go! Solar panels require very little maintenance over their usable life and are built to last for decades. That said, you will undoubtedly want to check on your panels from time to time to make sure they are working properly. In this post, we will follow Victoria, a homeowner who purchased solar a year ago, as she learns how to ensure her panels are working. If solar panels are the brawn of your solar system, then the inverter is the brain. Your inverter makes the direct current (DC) produced by your solar panels useable as alternating current (AC) for your home. The inverter is the first place to check to make sure your system is working properly. Image Courtesy of SolarEdge. 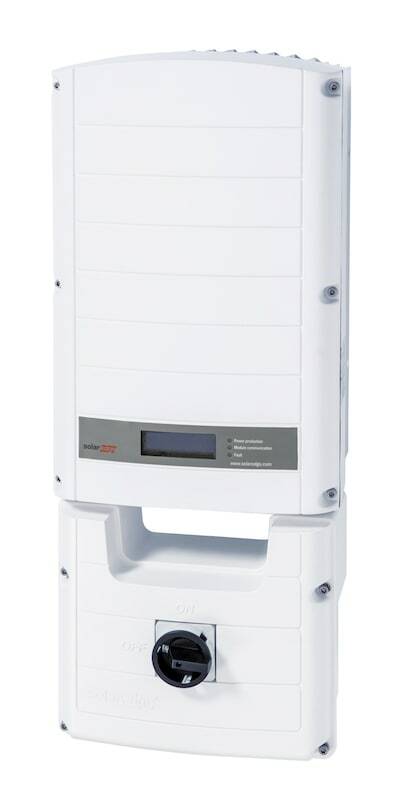 SolarEdge SE3000A Inverter pictured. And if you don’t have one of those, you probably have micro-inverters, small inverters that are attached on the back of each individual solar panel on your roof. Micro-inverters tend to come paired with monitoring software that your provider may make available to you (more on that later). Again, check the paperwork from your solar provider or call them and ask to be certain. Now let’s see what type of inverter Victoria has on her system. Victoria has a string inverter on her rooftop system, which means all of her panels are wired together and the electricity then flows through a single inverter. With either type of inverter, a panel failure will result in fewer kilowatt hours (kWh) of electricity production over the course of a day. A little shading for a few days isn’t a huge deal, but if you have one or more panels that have a technical issue, it is something you will want to get fixed sooner than later. Now that you know which inverter you have, how exactly do you find out how many kWh your panels are pumping out at any given time? This is where monitoring comes in, and the exact method you will use depends on your solar installer and your specific hardware. Most solar companies provide some kind of monitor for the systems they install, which may be a physical monitor at your home or an app you can access online. If your provider doesn’t offer a monitoring service, you can track energy production through the inverter itself. If you have micro-inverters, your provider will need to provide an app or website to access the inverter data. If you’ve had your panels for a while, you can compare your output to previous weeks or months to monitor production. If your panels are new, you should use the monthly kWh estimate that your solar panel provider gave you for comparison. 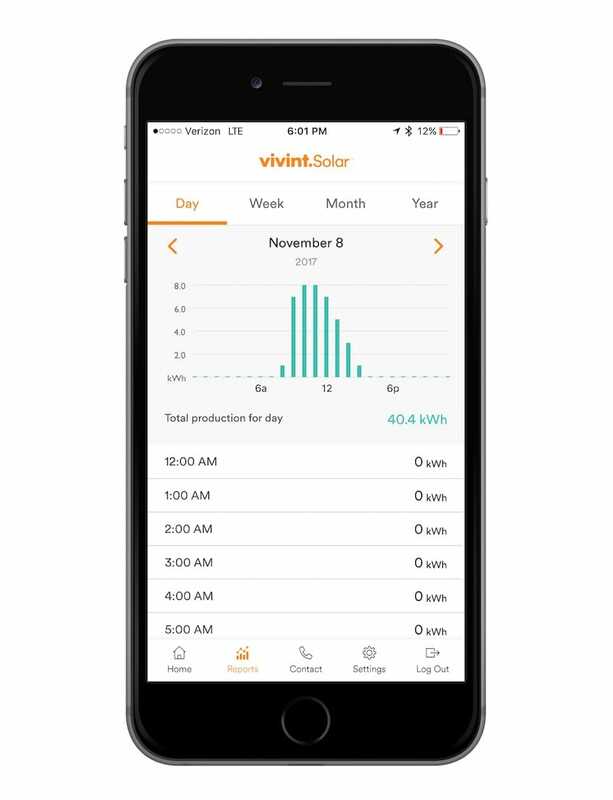 Solar Production Monitoring on Vivint Solar App. Victoria’s panels are about a year old and she has been monitoring her production regularly through the hub. During sunny springtime months, Victoria’s panels usually generate about 40 kWh each week, but this May she notices her panels are only kicking out 25 kWh each week. It’s been sunny most days this month, so Victoria suspects something is wrong with her solar panels. Victoria isn’t an electrician and she’s not comfortable climbing onto her roof, but there are still some quick troubleshooting steps she can take before reporting a problem. Victoria has already taken the first step, which is to check the weather. If her panels are producing less and it’s been overcast, or her panels have had snowfall accumulation some of the month, that would likely account for the difference in electricity generation. There’s been ample sunlight in Victoria’s neighborhood so she’s going to the next step: to check for anything blocking the panels. Solar panels require very little maintenance, but if debris blew onto Victoria’s roof during a storm, something could be covering all or part of a panel. Upon closer inspection, Victoria sees that one of her trees is taller than it was last year - the leaves have come out for spring and some of her panels are now partially shaded in the afternoon. Because Victoria has a string inverter, she knows that small shade area could affect more than just the shaded panels. Victoria pulls out the pruners and her system is up to 42 kWh the following week. If the troubleshooting tips above didn’t solve your problem, we recommend going online to your solar provider’s website to see if they have any additional troubleshooting options to follow. If they don’t, it’s time to call your solar provider. If you own your solar panels and they are less than 10 years old, they are likely covered by your provider’s warranty. If you are a Solar Lease or PPA customer, your solar provider is responsible for maintaining the panels and ensuring their production. The solar company should send a technician to examine your panels and fix any problems. If your panels are NOT covered under your solar provider’s warranty any longer, your next step should be to find out if they’re covered by the manufacturer’s warranty, which is usually 25 years. Contact the manufacturer and find out if they have any specific requirements for warranty claims before you contact an electrician. Once you understand their process, you can call a professional to come examine your panels. Now that you know the basics of monitoring your solar system’s energy production, you can relax, knowing that your panels are doing their best work. If you do notice a drop off, understanding your inverter type can help you troubleshoot. And if there is a problem with the system, now you know where to turn. Of course, this is one reason it’s so important to choose a solar installer with good customer service and a history of success - hear from a few of our customers about their experience here.